Headed down to Tai Seng today with Dorcas and Charlene La Lapine (Who has gorgeously dyed hair! I was a tad lost for words initially because I saw her not too long ago and she had dark hair! She was really, really very pretty! 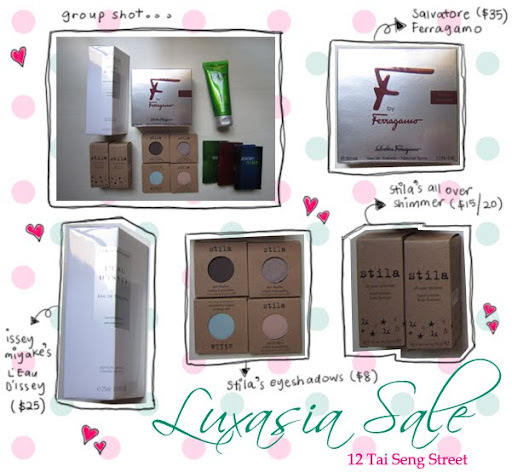 (: ) to attend the Luxasia Sale! This is my first time (Dorcas too!) attending a makeup/ beauty sale so I was really excited! But oh boy! Even though we arrived at around 11.10am (Doors opened at 11am. ), the place was crowded already! There were more perfumes than makeup. Makeup included Stila (When you enter the place, turn to your left and head straight to the corner. ), Guerlain, YSL and RMK. Bags from Paris Hilton were also there (Along with some others.). There were also shirts (Guy Laroche, I think. Not too sure.). The first thing Charlene La Lapine did was to head to the Guerlain counter! Haha. But, because I'm a student on a budget, I don't know much about high-end brands (Which probably means that I should have checked it out. -_-||| ) so I headed off with Dorcas to check out the perfumes. We made one round and Charlene La Lapine was still at the Guerlain counter! I'm not sure what she bought though because we had to leave to meet another friend for lunch (Sorry that I couldn't stay long, Charlene! ): ). The gold shimmer is for my sister, who's a lot darker than me. And the pink one... Heh. Heh. Heh. It's for ME (Completely guilt-ridden, since I have Benefit's High Beam. :X)!!! And here's a very happy me after a super long day! In front of an incredibly messy table (The mess will vanish tomorrow! Got to pack for school! ).